PHILADELPHIA, PA--(Marketwire - April 19, 2010) - ON DEMAND Conference & Exposition - Konica Minolta Business Solutions U.S.A., Inc. (Konica Minolta), a leading provider of advanced imaging and networking technologies for the desktop to the print shop, today introduced the bizhub PRESS® C8000, the first in the company's innovative bizhub PRESS production print product line. 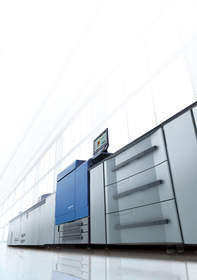 With the launch of Konica Minolta's next generation of digital presses, the bizhub PRESS product line features superior color accuracy and management, enhanced media handling, and impressive productivity, making it an outstanding introduction to Konica Minolta's award-winning line of digital color systems. Witness firsthand the award-winning technology from Konica Minolta at the 2010 ON DEMAND Conference and Exposition (April 20 through April 22) at the Pennsylvania Convention Center in Philadelphia, Penn. To schedule a personal tour of the Konica Minolta Booth (#1324) and/or an executive interview, please contact Rachel Reed at Rachel.Reed@kmbs.konicaminolta.us.